The CSLB Spring 2015 Newsletter was sent out today. Here are my highlights… or lowlights. For over two years now they have been putting applicants through the wringer with their “profiling” of specific applications. They continue to quote the regulation that requires them to perform a secondary review of at least three percent of all apps received. What I’m hoping/praying will happen is that the State Legislature or an attorney will finally call the CSLB to the mat on this. They are not randomly selecting applications as the law states, they specifically profiling and targeting these classifications. Last week I was told by a CSLB employee that they should no longer use the term “critical classifications.” I guess they realized that using this term was illegal. DUH!!! They can’t just decide on the whim of a single power hungry CSLB employee to profile specific individuals. In this series of posts, I’ll tell you how to get a California Contractors License. On to part 3. 12) What happens if I fail the exams? 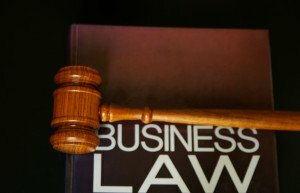 The Law and Trade exams are scored separately, and you can take either exam as many times as necessary for 18 months (at $50 per retake). If you don’t pass within 18 months, you have to reapply. If you passed one of the exams it still counts for up to 5 years. 13) Is Workers’ Compensation Insurance Required? Yes. Unless the entity has no employees, then a certificate of exemption can be filed with the Board. *The law now requires that roofing contractors must have W/C whether or not you have employees. 14) What is the cost to apply for a license? The application filing fee is $250, the Initial License Fee is $150. Both of these fees can be paid when the application is submitted. If the applicant chooses to remove his or her application after submittal, only the Initial License Fee will be refunded. 15) Can I apply for more than one classification at a time? No. You need a license number before you can apply for an additional classification. So, for example, first you might get a B license as a general builder, and then later add an classification such as a C-10/Electrician. Yes. The CSLB has reciprocity agreements with Utah, Nevada and Arizona. It is possible to get a CA license if you hold a license in one of these states by only having to take the CA Law & Business exam. The key is, you must have been licensed in the other State for a minimum of 5 out of the last 7 years. 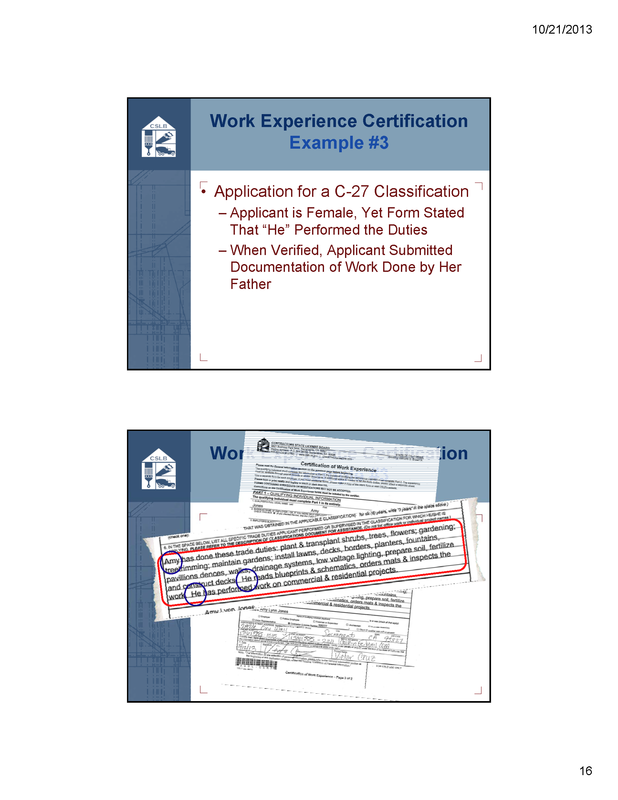 Coming up… How to get a California Contractors License Part 4. The California Contractors State License Board (“CSLB”) has announced that it’s beefing up its Public Works Unit to help ensure that contractors bidding and performing work on public works projects are complying with wage and worker’s compensation laws. The CSLB’s worker-focused expansion follows the California Labor Commissioner’s record-breaking prevailing wage enforcement actions this year. And if recently enacted legislation is any indication, labor law will continue to be a hot topic this coming year. Read the entire article here: via [New post] 2014 California Construction Law Update. Phil – I think you’re right about flagging Asian last names. As I explained to you in my private message, I’m being asked for all kinds of documentation for my Class B. And, I have an Asian last name. Go figure. They didn’t take my business classes, algebra, advanced math or my CA real estate license and appraisal courses into consideration at all. First I was told that they can’t call my employer out of state, so they want 1099’s and check stubs. Fine. Sent them. The Licensee Deputy approves and then they send me to an Experience analyst. She tells me that the 1099’s are useless, because I, “could have earned the money doing anything”. So why did you ask me to hunt down an old, handicapped prior employer 3,000 miles away to get the darn things? She tells me that my application shows c6 work and not Class B. She sends me a form asking if I want to withdraw my application. I emailed Andrea S. and asked her since when cantilevering decks, framing additions, siding and roof work is millwork. She said it was millwork and not general building! How ’bout that? She asks me to provide permits and contracts. I explain that as a journeyman employee I’m not required to have either, and that legally my contractor employer isn’t even required to keep those docs for more than 3 years. They then asked for client contacts, which I don’t have as an employee. She says that I need to go back to the elderly, sick employer 3,000 miles away and get a notarized letter from him outlying my duties. I included hours worked, duties by year for the 10 years through apprenticeship (4yrs) and journeyman level (6 years). What else should he document in the letter? I do think I’m being targeted. When I explained that I felt that shuffling me from department to department for 10 months now is excessive, and I don’t understand why they ask for documentation that they then tell me they can’t use (like the 1099’s and pay stubs), I’m told that I need permits and the notarized letter from my certifier. Wasn’t his certification enough? No, because he was a foreman and not a contractor. Again, I have no legal reason to have permits as a journeyman. I think they just don’t want to license me – possibly because I’m Asian. I even included letters from people who can verify that I’ve done extensive work on my own homes. I offered to send in 200 material receipts to verify the work and was told that they weren’t needed. What else can I send in to help with this? I may actually be speechless!!! Oh wait… no I’m not. Your experience with the cslb just floors me!! How incompetent can one state agency be? Seriously?!? You give them what they ask for, what they have listed in their ridiculous list of acceptable items, then tell you they won’t accept them. 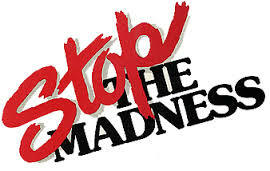 I truly wonder (often) why the patients are running the asylum! My advice is to contact your State Representative! Show the rep the letter the cslb gave you with the options. Show the rep what you provided, per their list, and show the rep the response you received from the cslb. It has been pointed out to the Board, directly, that the licensing unit is asking for docs that most applicants aren’t required by law to need or obtain. Yet, they keep asking for them. Then they have the nerve to reject those docs. I wish I had proof in hand that the cslb is profiling Asian applicants, but they are just smart enough not to have put anything in writing… as far as I’m aware. I was just told that the license techs were verbally told to pull apps with Asian last names. So suggesting to a State Rep that you’re being profiled would most likely be flat out rejected by the cslb. For me… I’d mention it anyway. Let the cslb hear the accusation so they know what they’re doing is out in the public. Like I said… I was almost speechless. 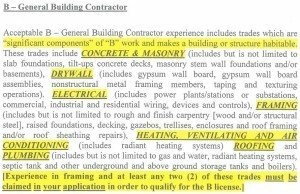 via California Licensing – Page 70 – Contractor Licensing – Contractor Talk. 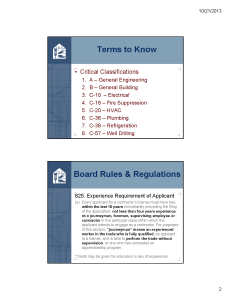 Below are a set of powerpoint slides that were shown at the recent Contractors State License Board Licensing Committee Meeting held at the CSLB office in Sacramento on October 21, 2013. Along the way, I’ll add my advice and opinion where necessary. Click on the images to enlarge. These slides are self explanatory. You should refrain from using words like; he, she, I, we, us, or your personal name. The experience should always begin with… Experience includes…. then list your daily trade duties performed in the field. Remember…. do NOT list administrative experience. 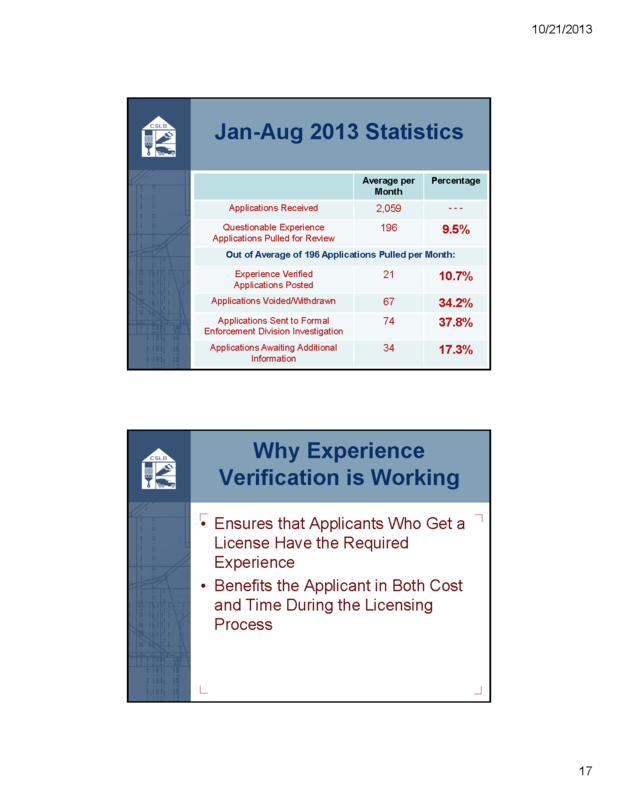 Slides #27-28Slide #27 gives some stats of applications received, processed, rejected. I think these numbers are way too low and don’t encompass what exactly is taking place.Slide #28 states this application processing procedure ensuring that the applicant has the proper experience. Isn’t that what the test is for? Could anybody just walk in and take the exams without any trade experience? I say, let the exams be the lithmus test!After that the slide states that the application processing procedure benefits the applicant in both cost and time. This one blows me away! 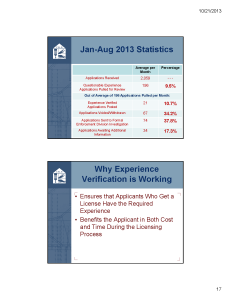 How is it benefitting the applicant in cost when the chance of their $300 application filing fee disappears? According to them, it happens to 34.2% of the applications every month. And that number doesn’t include the applications that were withdrawn or denied after it was sent to formal investigation. 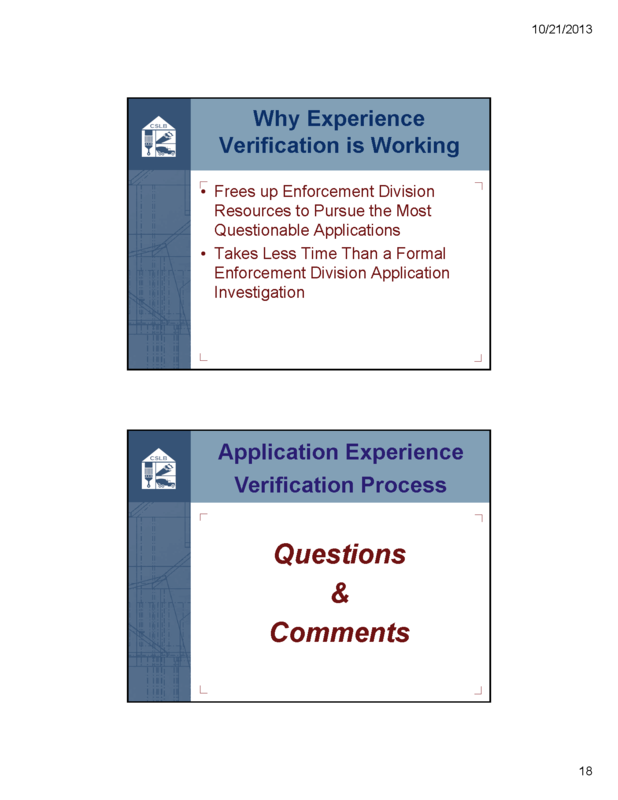 Slide #29States this process frees up enforcement division resources to pursue the most questionable applications. Again, who is determining what “most questionable” is and what is their criteria? The application that uses “he” or “she” in the experience outline? Then it goes on to state that it takes less time than a formal investigation… let’s see… it’s currently taking “non” formal investigations almost 2 months for the applicant to receive the reject letter, return the docs, and have them reviewed. Looks like a push to me. Either way, you’re going to be waiting 3-4 months before your application is even posted and an exam date issued. From there, you’re waiting another 3-4 weeks before you sit for your exams. That concludes this series of posts “CSLB Qualifying Experience – Final Part” regarding the Contractors State License Board Licensing Committee meeting and powerpoint slide presentation. The bottom line is… have all of your ducks in a row before you submit your application. And I would recommend that you have me review your application and your work experience history first. Paying me $75 could save you $300 and months of heart ache. Below is an article I found about how to start a construction business. There are many great links to information on the Small Business Administration’s (SBA) website. I can also provide you with guidance, information, and tools to help you start your construction business. On my services offered page, we include corporation formation, bonding and insurance services, and of course, license application services. Interested in getting into the construction business? Now might be the time, with market forecasts courtesy of IBISWorld predicting a steady rise in the value of the construction industry over the next five years – 12.5 percent annually for residential construction and 13 percent for private non-residential construction. If you’re interested in starting a construction, home improvement, or contracting business, here are some business and regulatory basics you need to be aware of. Start by familiarizing yourself with the basic steps involved in planning and forming any kind of business, including planning your business strategy, incorporating and registering with the right government agencies. 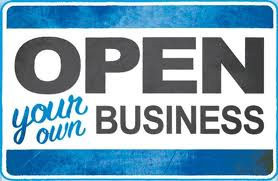 Read these essential 10 Steps to Starting a Business from SBA.gov. 1) Business Licenses and Permits – In addition to a general business license, most construction or contracting businesses need specific licenses to operate legally. 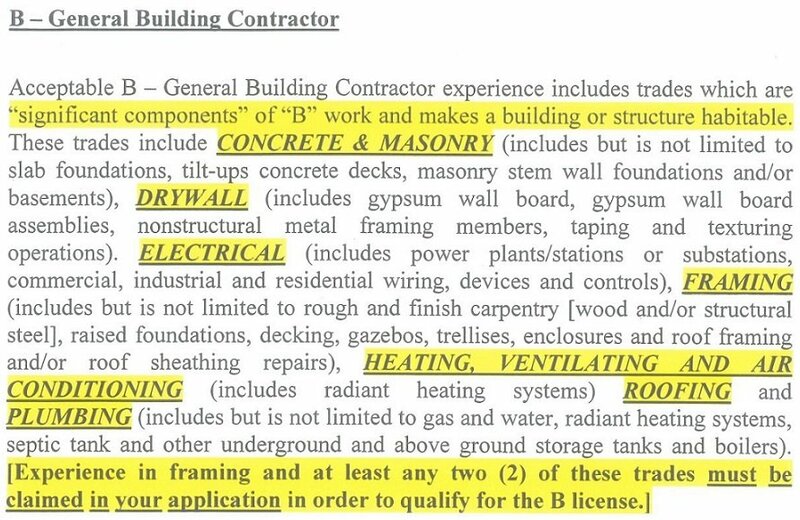 For example, a tradesman license is required for electrical, plumbing, HVAC, gas fitting, and other construction trades. Use this handy SBA.gov search tool – “Permit Me” – to identify the exact license and permits you’ll need. Just enter your zip code and business type. Local government websites also list this information and can guide you through what you’ll need. 2) Surety Bonds – A surety bond is not something many business owners think about, but in almost all cases, construction businesses need construction bonds in order to operate legally. You arrange for a surety bond from a third party who promises to pay your client if you do not fulfill your work obligations under a contract. Bond regulations vary by state, so research your state’s requirements or speak to a reputable surety bond agent. If you are unable to secure a bond through a commercial channel, SBA offers its own Surety Bond Guarantee program that can help. 3) Insurance – Depending on the nature of your work and whether you employ workers directly, you will need several types of business insurance. Consider getting general liability insurance as well as vehicle and property insurance. This will protect you against claims for personal injury and property damage, and cover the costs of legal proceedings. Individual states also require businesses to carry specific insurance, such as workers’ compensation insurance, unemployment and state disability insurance. 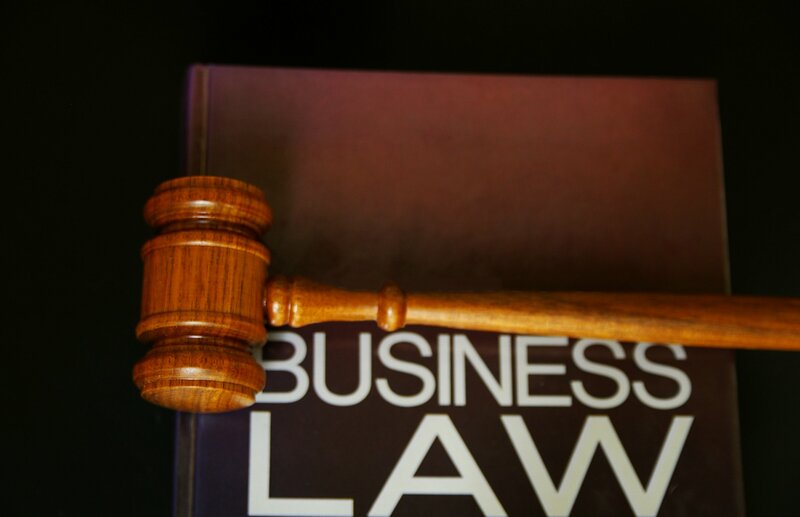 Read this article for more information on business insurance: Business Liability Insurance – Tips for Protecting your Assets with the Right Coverage. Remember: jobsites won’t do business with you unless you can prove you have the right coverage. From energy efficiency standards to workplace safety regulations, the construction industry is heavily regulated. Read SBA.gov’s Construction Industry Guide, which compiles everything you need to know in one place. OSHA Construction e-Tool –This interactive, web-based training tool guides you through common construction hazards and how to prevent them. The construction industry generally secures labor from four sources – subcontractors, hired employees, labor brokers, or independent contractors. Of course, the law differs in how you work with each of these. For example, when hiring employees, you’ll take on additional obligations such as withholding taxes, paying wages, benefits, complying with employment law, and so on. To get you started read, 10 Steps to Hiring your First Employee on SBA.gov. While there are no specific laws governing how you work with subcontractors, you may wish to draw up a contractual agreement and ensure that they, too, are licensed, bonded, and insured. If you engage a broker to find labor, you will pay the broker directly. If you hire independent contractors (self-employed individuals), you will pay them directly but, unlike employees, you are not responsible for paying benefits or withholding taxes. 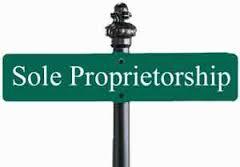 There are strict tax reporting requirements for working with independent contractors. Read about them here. via How to Start a Small Construction or General Contracting Business | SBA.gov.